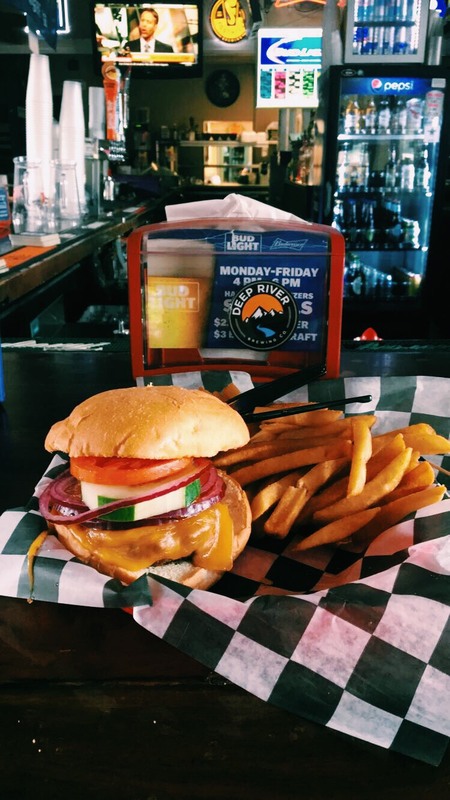 This week’s Tasty Tuesday stop was East Village Grill and Bar. 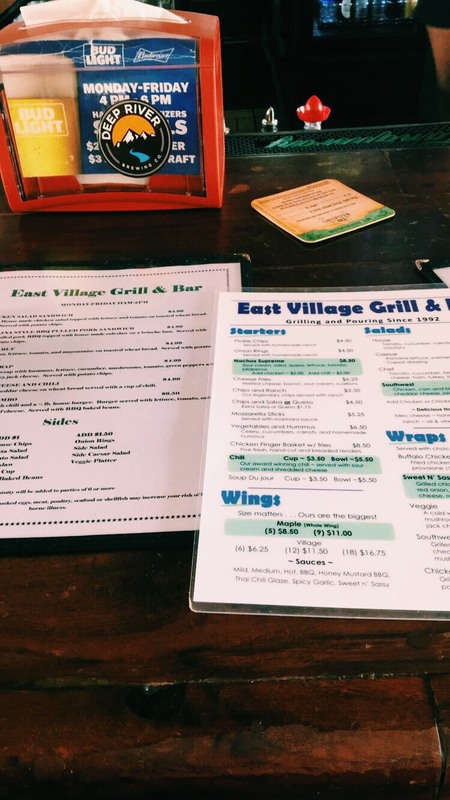 East Village Grill, better known as EVG by locals and students, offers a laid-back dining experience for all who visit. I took a walk down there early in the day during a break in the rain and with a cool breeze blowing - man, EVG did not disappoint! While still early in the day, I was able to walk in and grab a spot at the bar. The atmosphere was cozy and the service was welcoming. After chatting with the bartender and looking over their lunch specials, I wound up ordering off the regular menu. I’ve been known to be very picky about the food I eat, but what caught my eye on the menu was a burger called the Farmer’s Daughter. What’s so different about this burger is that it comes with cucumber; which sounds a bit odd at first but I had to give it a try. The burger itself comes with your choice of 1/4 or 1/2 of beef (or grilled chicken if you’re looking for a healthier option), lettuce, tomato, onion, cheese, mushrooms and cucumber. I opted out on the mushrooms, but after taking my first bite, I knew that this quite possibly might be the best burger I’ve had in awhile. I love cucumbers, and I mean LOVE, so I might also be biased. The cucumber was bursting with fresh flavors and a certain juiciness that complimented the burger itself. I will say I ate the burger quicker than I would like to admit and the juiciness made it pretty messy, but all in all it was a great experience to try something new. EVG has been a welcoming and open place for years, making it a staple for anyone at NC State or visiting the Raleigh area. 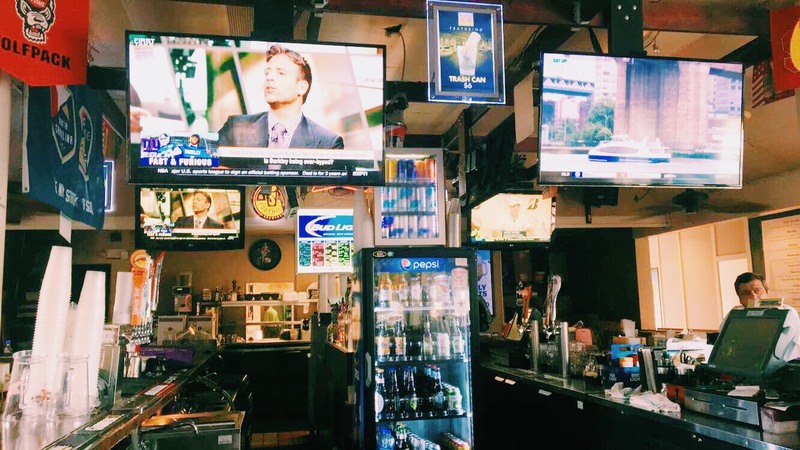 Be sure to catch your local students and alumni there on Wednesday nights for Karaoke!